With more than 40 years at the junior, university, NHL, international, and World Championship levels, five-time Coach of the Year Dave Chambers has spent countless hours on the ice developing players at every level. Practice after practice, he puts drills to the test, compiling the best here in The Hockey Drill Book. Whether your goal is to raise your game or coach your team to the top, The Hockey Drill Book is the go-to resource. It's the only drill book you'll ever need. "For more than 40 years Dave Chambers has been sharing his exceptional knowledge and wisdom as a coach, teacher, and specialist within the world of hockey. His brilliant forward-thinking instruction guides are long lasting yet new to coaches everywhere. He is a world-renowned student and teacher of the game and a man I admire and greatly respect. His information is useful to coaches everywhere." 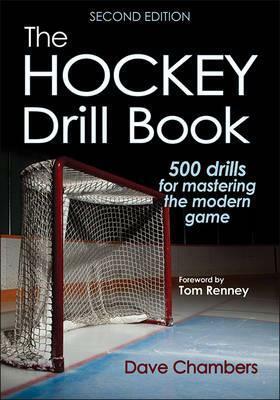 "The Hockey Drill Book demonstrates Dave Chambers' intimate knowledge of the game. He has the ability to simplify every skill set. This collection of drills is an absolute must for individual player and team development." Chambers was an assistant coach with NHL's Minnesota North Stars and head coach of the Quebec Nordiques. He coached the Canadian national junior team to the gold medal at the World Junior Championship in Moscow in 1988, the Canadian team to the championship in the International Spengler Cup Tournament in Switzerland in 1987, and the Canadian student national team to the silver medal at the World Student Games in 1985.